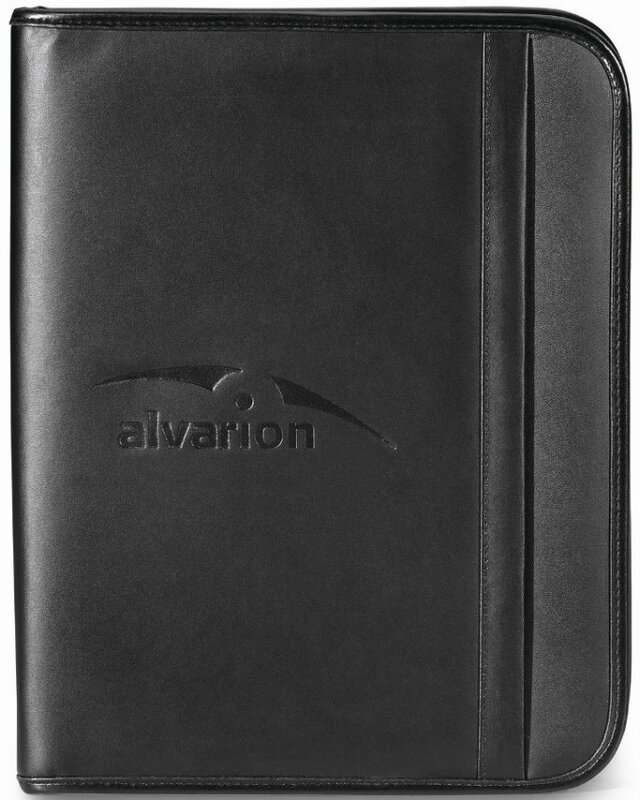 Noble in style and application a modern design full size leather padfolio. Applications include corporate padfolio, technology, educational gifts. FlipTuck feature for viewing notes, 8 1/2 x 11 writing pad. Overall size of the padfolio 10 1/4 w x 13 h x 1 deep. Rush Production available, no extra charge. or horizontally with spine at bottom in area 5" w x 4" h.
Factory debossing die charge is $75.00 one location. Our conference was last week and all the ladies without exception were pleased, thrilled, absolutely happy with the Noble Leather Tablet Organizer conference gift. The guys at PII did such a wonderful job on our logo and quality of the products was such it was much better than we expected. Absolute satisfied customer in Alabama.